Schools across the country not only sanctioned it, but they supported it and actually punished those who chose to abstain. The walkout was little more than young people conforming to government authority by parroting the government-approved message in a government-approved venue—even at the government-approved time. The message was simple: we want this government to take our rights away. Young Americans across the country marched to demand less freedom from their rulers and the mainstream media, celebrities, and politicians alike shoved this down our throats as some grassroots heroic political activism. However, it was the opposite, and now even the cheerleaders of this movement, David Hogg, Emma González, et. al., are beginning to realize what happens when you beg the state to take away your rights. They take away your rights. On Friday, the Broward County School system announced its plan to violate the students’ right to privacy be implementing a clear backpack policy. “Clear backpacks are the only backpacks that will be permitted on campus,” said Broward County School Superintendent Robert Runcie said in a letter sent to parents. Now, all students will have to allow anyone at anytime to view the contents of their backpacks as well as wear IDs so they can be properly identified by school authorities. These new measures now have the darling activists on the defensive. “I’m not happy with it. Why are you punishing me for one person’s actions?” Tyra Hemans, 19, a Stoneman senior, told CNN on Friday. But this is exactly what they wanted. These students wanted to punish the tens of millions of law-abiding gun owners by demanding the government take away their right to defend themselves—all for the actions of one person. Now, they are getting a taste of their own medicine, and it stinks. “It’s unnecessary, it’s embarrassing for a lot of the students and it makes them feel isolated and separated from the rest of American school culture where they’re having essentially their First Amendment rights infringed upon because they can’t freely wear whatever backpack they want regardless of what it is,” Hogg said. Trampling the 2nd Amendment is just fine to David Hogg, but touch the first, which is upheld by the second, and you are a tyrant. “One of the other important things to realize is many students want their privacy. There are many, for example, females in our school that when they go through their menstrual cycle, they don’t want people to see their tampons and stuff,” he explained. “What we should have is just more policies that make sure that these students are feeling safe and secure in their schools and not like they’re being fought against like it’s a prison,” he added. The irony of the students’ ignorance is astonishing. Luckily, there are still many people out there that see this irony and are calling it out. It’s REALLY frustrating when the law abiding are punished because of the actions of a criminal. 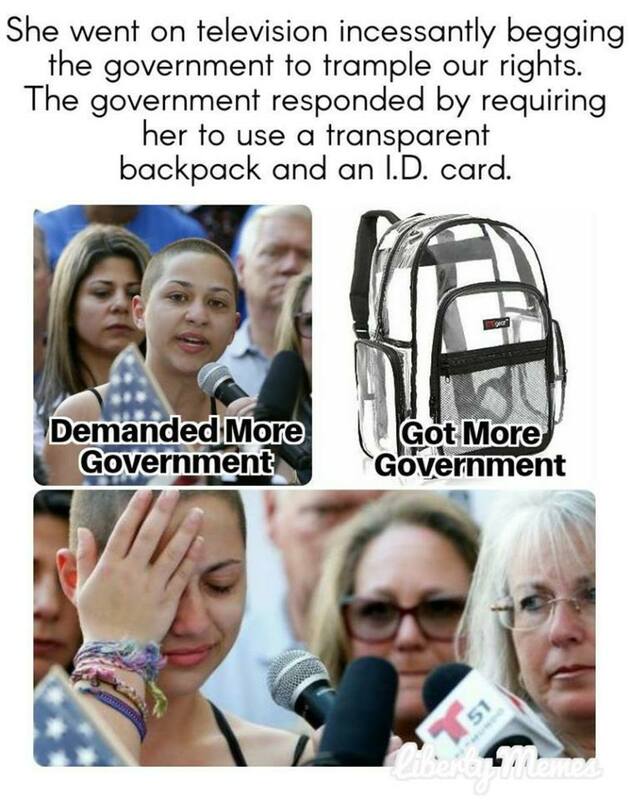 Require kids to have clear backpacks? Indeed, when you advocate for only government to have guns, you are making the entire country a prison. Bravo young America, you have successfully asked for fewer rights and you now have fewer rights. Hopefully, this serves as a wake-up call to those who think it is somehow heroic to punish law-abiding Americans for the actions of a single deranged lunatic.